Recorded by Niko Schauble. Mixed and Mastered by Lachlan Carrick. Available as cardboard gatefold CD package and 96k/24bit digital download. Ballads album featuring Barney McAll, Jonathan Zwartz and Allan Browne. Recorded by Ross Cockle. Mixed and mastered by David Darlington. Available as cardboard gatefold CD package and 44.1k/24bit download. Available through Birdland Records. Officially launched at the 2013 Wangaratta Jazz Festival – beautifully recorded, amazing collection of Zwartz originals performed by Jonathan Zwartz, Barney McAll, Phil Slater, Julien Wilson, James Greening, Richard Maegraith, Steve Magnusson, Hamish Stuart and Fabian Hevia. Winner of the 2013 AIR award for Best Independent Jazz Release and 2013 ARIA Award Finalist. Swailing is a very Australian concept, a controlled burn of the bush aimed at promoting regrowth. In spite of the title, the music on this CD has a very European feel, at times reminiscent of an ECM recording, no doubt as a consequence of the unusual composition of the trio, no rhythm section but with an accordion. But there are important differences mainly flowing from song selection. After a delicious Wilson penned opening track, with the marvelously titled “I Believe This Belongs To You” comes Hermeto Pascoal’s “Little Church”, most famously heard on Miles Davis’s “Live Evil”. A little later, Gabriel Faure’s “Meditation”, Hoagy Carmichael’s “Stardust”, even Fats Waller’s “Jitterbug Waltz” and finally, Ornette Coleman’s “Chanting”, plus several originals. The trio benefits from having performed together over many years (their first CD, “Live” dates from 2007) as they weave in and out with a beautiful precision that only experience can bring. All three members both solo and provide accompaniment, the resulting music ebbs and flows producing a gorgeous sound. The occasional overdub fills out the music, most notably Wilson’s bass clarinet. Although mostly subdued, it is a strangely uplifting and enjoyable music. Grant is just fabulous throughout; Magnusson demonstrates that he is an all-round guitarist and in places squeezes out very un-guitar like sounds. All the while Wilson is sublime, at times his breathy tenor is reminiscent of Ben Webster. What makes this all the more impressive is that this was released together with a completely different album and band, the mainstream ballad collection, “This Is Always”, also on lionsharecords. On this album his Websterisms come to the fore. A tenor saxophone making gentle, sensuous jazz is a grand tradition, like paddle-steamers cruising on wide, slow rivers. Ben Webster Plays Ballads remains one of jazz’s must-have recordings, and now Julien Wilson eases his own tenor into that tradition, in the process creating one of the great Australian jazz albums. This is music where the horn’s sound seems to melt before your ears, becoming creamy, viscous and rather sly. Sometimes it is so fragile that it fades to little more than pulsing breath passing through the saxophone, or that fragility may find release in a sudden cry. Wilson has all this in place and his phrasing is so relaxed that the tenor seems to massage you as you listen. The pieces are mostly ballads, of course, including some originals, and pianist Barney McAll, bassist Jonathan Zwartz and drummer Allan Browne are peerless at making them heartfelt, rather than just being pastiches. Any music becomes new, after all, when played with complete conviction. 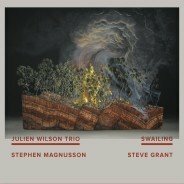 Wilson has simultaneously released a gorgeous album by his trio with guitarist Stephen Magnusson and accordionist Steve Grant called Swailing. Buy both. 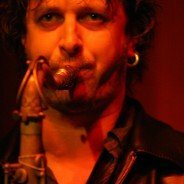 Melbourne saxophonist Julien Wilson had an interesting 2013, the lowlight being a minor surgery gone wrong, which saw him hospitalised for a couple of weeks (at one stage in serious danger), and unable to play for another several weeks. Happily, he bounced back in time to play some memorable gigs at Wangaratta Jazz (and then at Bennetts Lane), some of them promoting his recent recordings. Wilson made crucial contributions to recent releases by bassists Jonathan Zwartz and Sam Anning. But he has really excelled himself on these two recordings under his own name. Swailing features his long-running trio with Stephen Magnusson (guitar) and Steve Grant (accordion). They share a remarkable affinity, favouring a spacious sound, wherein the sighing tones of the two Steves cushion and embrace Wilson’s most attractive, yearning forays on the tenor sax. Or (which is a new aspect, for this trio at least) his playing on soprano sax or bass clarinet. There are 14 tracks here, many of them quite concise. Wilson and Magnusson provide several originals, and there are interpretations of pieces by composers as diverse as Ellington, Ornette, Waller, Hoagy Carmichael, Gabriel Faure and Hermeto Pascoal. The unusual, yet attractive, combination of instruments is perhaps the first thing you’ll notice, before you appreciate the rare skills of all three players, and their ability to combine their voices so seamlessly. This Is Always finds Wilson playing a program of standard ballads, leading what he describes as a ‘classic’ quartet: tenor sax, piano, bass, drums. It seems that Wilson avoided recording in this format until he felt ready. And he certainly was ready to play these songs – gorgeous ballads like ‘This Is Always’, ‘Body And Soul’, ‘Deep Night’, ‘Stairway To The Stars’, plus a few compatible originals – with a level of maturity, and a storytelling quality that place him proudly in the lineage of such great tenor balladeers as Lester Young, Dexter Gordon, John Coltrane, Stan Getz and Joe Lovano. Of course, it helps that he was joined by the very special combination of Barney McAll (piano), Jonathan Zwartz (bass) and Allan Browne (drums). The pianist has a long history with both Zwartz and Browne, but this was the first time the three had played together as a rhythm section. They combine as if they have been working together for years, achieving an effortless depth of swing that is not often heard here, and inspiring Wilson to play with admirably understated eloquence. The solos from McAll and Zwartz are consistently superb, too. In the mood for some classic jazz ballad playing? Do not miss this album. These are curious and poignant days for those of us who have felt connections to a stream of Australian music that began flowing as far back as the 1940s with Graeme and Roger Bell and their colleagues (who in turn connected us to Rex Stewart, Duke Ellington, Louis Armstrong, Jelly Roll and all that has since transpired). Dave Ades and Bernie McGann – both great alto players, and also dear friends – have moved on, while others, including Julien Wilson and Allan Browne, have experienced extreme vicissitudes of health. It is easy to inflate what is in fact a small cluster of coincidences and the simple inevitability of people reaching a certain age – though some are in fact quite young – but very deep feelings have been tapped. It is easy to see omens in nature. Bushfires have raged in the Blue Mountains and charcoal and burnt sienna smoke has spread down over Sydney. The sun at some hours has burned through with the orange of an electrical element, and late in the day in a weird neon disc of hot pink. But firemen came from Victoria and New Zealand to help. Furthermore the rain is crashing down now at last and the black streets are splashing and shining in the night. On cue, as it seems, I have received This is Always, plus two others, reviews of which will soon follow. In the notes to this disc, Julien Wilson says, ‘This is my first recording with a Classic Quartet playing standards’. What, then, are standards in this context? Tunes that have become standard fare in a repertoire sometimes revisited often, sometimes rarely. ‘All Shook Up’ and ‘Slippin’ And A-Slidin” are rock and roll standards. They are perhaps my favourites in that area, speaking to me from my mid teens in the mid 1950s – the classic rock and roll era. Yet they are rarely played. This is true also of a broader stream of standards, but some of these are visited perhaps too often with too little attempt at understanding. This stream began pre-rock and roll and the tunes are usually in ballad form with the chorus leading and the verse forming a bridge (in recent pop the reverse is usually the case). These melodies may have begun their lives in movies or Broadway shows, or on the Hit Parade (as the charts were once called). Many have continued as vehicles for jazz expression and exploration, while others were written expressly for that purpose. This kind of standard can be presented as middle of the road fare, or it can be taken into abstract, lonely and even alienating regions. Willie Nelson once made an album of standards, because they were as familiar to him on the family radio as the Grand Ole Opry. I think my favourites are the mysterious and even somewhat cosmic standards, such as ‘Deep Night’ (beautifully played on this disc), ‘Deep In A Dream’, ‘Where Or When’, ‘Stairway To the Stars’, (also beautifully played here), ‘Midnight Sun’, ‘Laura’ (is the face in the misty light) and so on. The bluesy standard is represented here by Duke Ellington and Bobby Troups’ ‘The Sound Of Jazz’. Other examples elsewhere include ‘Stormy Weather’ and ‘Blues In The Night’. Some have become jazz standards and mainstream popular standards simultaneously – I think of ‘St Louis Blues’ and ‘Ain’t Misbehavin” , thanks to performances by such as Louis Armstrong and Fats Waller, who were at once influential jazz artists and world wide pop stars. Julien Wilson and his players have approached their sometimes unusual selection of standards from a particular jazz point of view, which means that both the formal and the emotional aspects of each are explored. McAll has explored many areas since he specialised in this music, but hear how easily summons the idiom. Treat it as pure music if you like, but you’ll most likely feel the grip of deep and subtle feelings. Some were home for troops in World War Two. You can feel that here. Stan Getz fell and died, or died and fell on stage playing ‘Out Of Nowhere’. Not all these melodies are in standard ballad form, and a few have been written by Wilson (making them originals not standards, though they could be the latter). Wilson’s ‘Trout River’ is particularly beautiful. 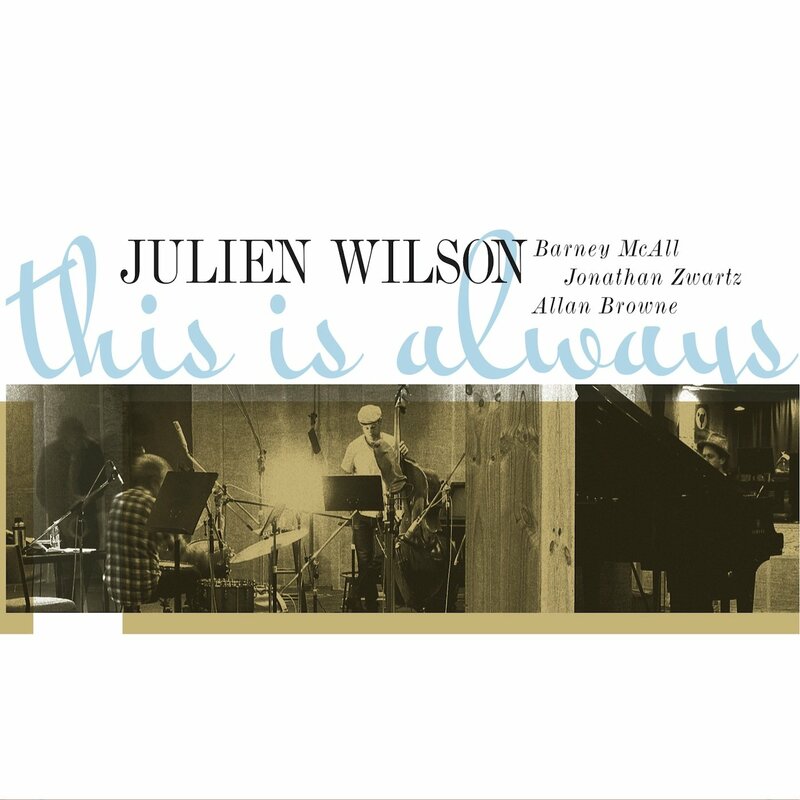 The band Wilson has chosen could scarcely be surpassed anywhere: Wilson (tenor saxophone and on the last track clarinet), Barney McAll ( piano) Jonathan Zwartz (bass) and Allan Browne, drums. Wilson notes incredulously that bassist Zwartz (from Sydney) and drummer Browne (from Melbourne) had never played together. They sound as if they have played themselves into a special musical relationship over years. Browne is, like myself, somewhat older than the others. And like Wilson he has distinguished himself in areas from deep trad to the avant garde. The rhythm section is of course of paramount importance in this melodically, rhythmically and harmonically subtle form, where the interacting band can seem to drift effortlessly as smoke across the land, or break into stress patterns, deep swells and concussions, like the sea. Look, I’ll say no more than that Julien is both subtle and magnificent. The tenor saxophone is like smoke, and it is like carved oak in his hands. Even at his softest his presence is large, and the same must be said for Jonathan Zwartz’s great dark bass, pizzicato or arcetto. Even at their softest, smokiest, most meditational or sensual this band keeps the form strong. Apparently this disc sold better than any other at Wangaratta this year. You should have it. A study will begin, and a deep connection. Here in Sydney Birdland is the most likely place to get it. MELBOURNE saxophonist Julien Wilson was one of the highlights of this month’s Wangaratta Jazz Festival where, among other appearances, he launched his quartet album, This is Always. Considering that only six weeks earlier Wilson had come close to death with anaphylactic shock during a hernia operation and has weakened abdominal muscles, his performances were remarkable. The new recording brings together a stellar group: New York-based pianist Barney McAll, Sydney bassist Jonathan Zwartz and Melbourne drummer Allan Browne. The title track opener, after McAll’s dreamy piano intro, descends deliciously into deeply moving tenor territory as Wilson delivers the theme in a beautiful re-creation of Coleman Hawkins. Then, as a perfect bass line and Browne’s subtly sophisticated brushes arrive, Wilson begins to softly explore with superb rhythmic sense, and the effect is everything a nostalgic, romantic ballad should be. Hawkins’s signature piece Body and Soul is reprised, or rather reinvented here at a slower tempo, and roundly imbued with a ceaseless flow of inspired ideas. Six of the nine tracks are wonderfully interpreted standards and the others are Wilson compositions, including a New Orleans style dirge, Farewell, featuring the leader’s excellent clarinet against bowed bass. There’s an infectiously swinging version of The Party’s Over and a slower, luscious rendition of Stairway to the Stars. 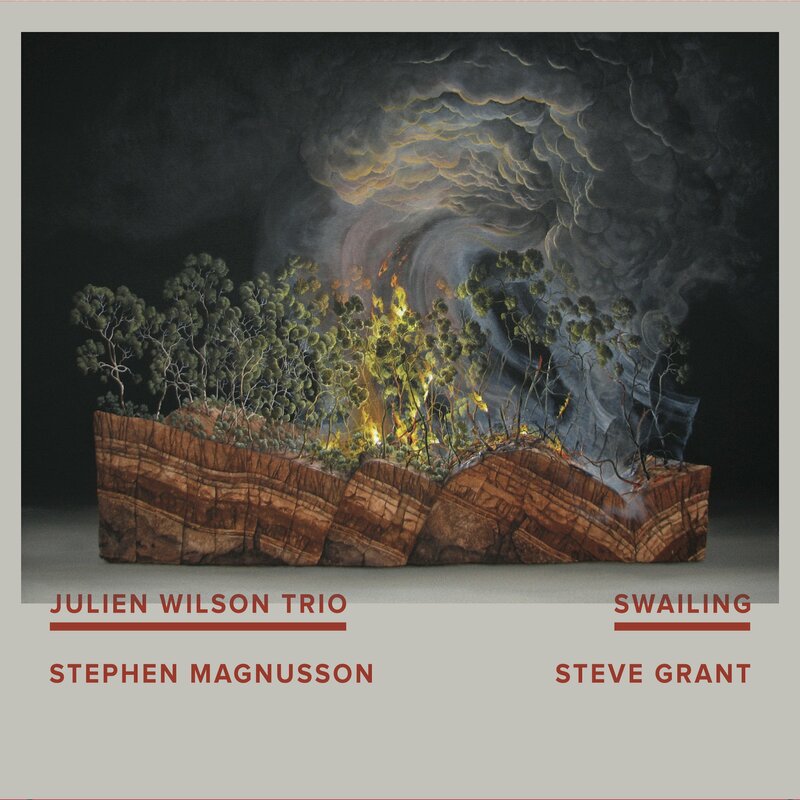 On the Swailing collection Wilson’s well-established trio uses its rather unusual instrumentation, adding Stephen Magnusson’s expert guitar and the perfectly appropriate accordion of Steve Grant to Wilson’s reeds. Grant’s instrument offers melodic and harmonic contributions, and one of the pleasant aspects of this album is the way these components are seamlessly exchanged between guitar and accordion. There’s a sprinkling of standards, including an all-too-short taste of Stardust for just over a minute of superlative tenor, and a quickened, impressive soprano sax workout on Jitterbug Waltz. An almost symphonic opening to Ornette Coleman’s Chanting has guitar and accordion continuing a wash behind the tenor’s climb into high-register excitement. Wilson’s command of the bass clarinet is evident in his composition Midway, where he lays down an ostinato for the guitar’s melodic statement and later overdubs some inspired soprano sax. The sumptuous harmonies of Gabriel Faure’s Meditation are unhurriedly explored by meaningful meanderings of the tenor as accordion supplies a backdrop and the guitar adds important countering notes. Bass clarinet reappears for Magnusson’s composition Various and employs some tricky reed effects over accordion chord stabs as the guitar lopes sedately along. Another of Magnusson’s originals, My First 2001, after an out-of-tempo beginning, features exuberant guitar jumps as accordion and tenor underscore. A similar sentiment ignites Wilson’s Everybody Happy as the tenor hits a jubilant lift-off. These two great new albums from top-level Australian jazz players can’t fail to enjoy widespread appeal. Some older listeners may recall an album by Archie Shepp (Live at the Donaueschingen Music Festival 1967) which features one track and one track only- ‘One for the Trane’. It begins with a lengthy bass solo by Jimmy Garrison culminating in his trade mark flamenco style. Memorable. Some of you may also recall David Murray’s ‘Special Quartet’ which of course, featured Trane’s rhythm section. My point? 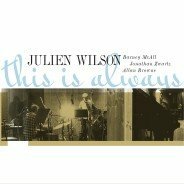 Julien Wilson’s album ‘This is Always’ has something to recommend it and is not a million miles from comparison with the aforesaid artists, and yet, it is an album of ballads including few ‘war horses’ such as Body and Soul. In short, we have before us an album “in the tradition” played by seriously accomplished modern musicians at the top of their game. Not a lick in evidence. Quite moving in fact. One of the highlights ‘Wine and Water’ is an original by Mr Wilson and sits appropriately in the middle of this recital. Solos by piano and bass are the highlights. – The track begins with a bass solo (2.04s) which in its power, feeling, timing and construction is a great musical moment. It sets the bar very high but Mr McAll, whose solo piano recital in St Patrick’s Cathedral at the 2013 Wangaratta Jazz Festival was, for me, the highlight of that festival, follows with a solo which moves from the bell like sounds of water falling to a percussive and powerful climax which matches Mr Zwartz’s bass. Mr Browne and Mr Wilson support and frame these solos, with some telling cymbal splashes and great timing and touch by Mr Browne on drums. ‘Farewell’ is drenched with feeling and recalls the tradition of ‘Flee as a Bird’ (Psalm 11) and is a stunning coda to a magnificent recital by this “classic” quartet. Mr Wilson is featured on clarinet. Music is feeling above all, and this album proves the rule. Maximum stars for this album. 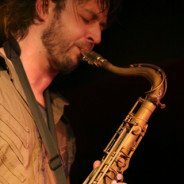 First, the weekend of gigs could have been re-named the Wangaratta Julien Festival in honour of the phenomenal playing by saxophonist Julien Wilson in so many line-ups. Julien recently had a close call during surgery in hospital, but recovered to play superbly. He seemed omnipresent. I heard him in five ensembles. In each his playing displayed almost all the qualities you’d hope to hear from saxophone or bass clarinet, from fiery blasts to deeply resonant mining expeditions or subtle soliloquies. Many of Julien Wilson’s solos this year will also remain in my memory, among them his freakily good explorations in Rebellious Bird, which he dedicated to Ades. Among other highlights was his rendition, in his first outing in a quartet format, of Paul Desmond’s Wendy, performed in honour of the recently departed Bernie McGann, and a finely nuanced solo on Deep Night. This year’s Wangaratta Jazz and Blues Festival was book-ended by two startling performances that testified to the strength and depth of the Australian jazz scene. On the opening Friday night, bassist Jonathan Zwartz led his stellar Ensemble through a series of compositions drawn from his recent recording The Remembering & Forgetting of the Air. It’s a tribute to Zwartz’s standing in the jazz community that he could assemble a band of this calibre, chock-full of individual voices, its depth bringing to mind the great bands led by Ellington or Mingus. Boasting some of the finest players in the country – Phil Slater, Julien Wilson, James Greening, Richard Maegraith, Barney McAll, Steve Magnusson – the Ensemble turned in a stunning performance that set the bar for this year’s Festival. Zwartz’s music struck me as peculiarly Australian, full of light and air; its gentle, lush tones recalling summer days and rolling surf. Emphasizing ensemble passages, over individual solos, Zwartz’s compositions explored textures, colours and mood, achieving an overarching beauty uncommon in contemporary jazz. But it was saxophonist Julien Wilson who really dominated this year’s festival, playing brilliantly with his Quartet; with his Sydney band B for Chicken; with the Anning-Wilson-Browne Trio; with Mike Nock; with the Jonathan Zwartz Ensemble; and with Dixie Jack. All this from a man only recently out of hospital, and who managed to also launch three new recordings at the Festival. Wilson’s performances with his Quartet, and with the Nock-Magnusson-Wilson trio, were genuine highlights of the Festival. During both performances, he spoke movingly of his good friend, sax player David Ades, who had been publicly battling cancer over the past couple of years. Wilson’s performance of his song ‘Rebellious Bird’, which he dedicated to Ades, was perhaps the finest version I’ve heard him play of a composition that already feels like a jazz classic. Sadly Ades, who played so brilliantly at the 2012 Wangaratta Festival, passed away just days after Wilson’s performance. During his Quartet performance, Wilson similarly dedicated a piece to the late Bernie McGann, who died in September this year; and also spoke warmly of his late teacher and musician Brian Brown, who died January 2013. It has been a year of losses for the jazz community, and Wilson’s heartrending performance of a recent work ‘Farewell’, played New Orleans style on clarinet, seemed to speak for everyone there. EACH player in this trio is foremost in Australia on his instrument, although ex-Perth bassist Sam Anning has relocated to New York. Saxophonist Julien Wilson and drummer Allan Browne are long-term luminaries in Melbourne, where the album was recorded. The 11 tracks are comprised of five pieces by Anning, one by Wilson and five well-selected standards. With the solo bass opening establishing a lyrical melody on track one, Anning’s Cactus Flower, two things are obvious: the beautiful resonance of the recorded instrument and the consummate artistry of its player. Following that intro, shimmering cymbals preface the arrival of Wilson’s softly luscious tenor as Browne sketches an out-of- tempo mallets backdrop to produce a highly sensitive, beautiful ballad. The first of the standards, Little White Lies sets a swinging medium tempo from the start and as Wilson starts an absorbing, enmeshing solo and the bass walks to Browne’s impeccable beat, the effect is nearly transcendental. Wilson plays clarinet on his composition Farewell, with a pretty melody and a south-of-the-border sound that he ornaments engagingly with assistance from a climactic bass solo. Soprano sax and bowed double bass provide a noteworthy opening to Anning’s Through the Open Window and the bass clarinet makes an effective reprise of Cactus Flower. Wilson’s warm tenor tone brings a lazy, sunny mood to Billy Strayhorn’s Little Brown Book, gradually strengthening throughout, and the horn’s lower register is put to excellent effect in The Best Thing for You is Me, followed by very smart and fast solos by all three. A virtuosic trio collection using interestingly varied instrumentation. When musicians play for each other rather than for themselves (or, worse, to impress) the instruments have a way of melting together, just as multiple ingredients become one dish. You hear it from the opening notes on Sweethearts, an album that in many ways is a throwback, and yet which carries the timeless relevance of three players hell-bent on praying before the altar of music, rather than before the many craven idols that easily sidetrack improvising musicians. 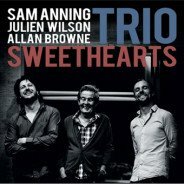 I say ‘throwback’ because Sam Anning’s tunes and those he chooses to interpret are embedded in a jazz tradition that has precursors in all decades between the 1920s and now, with especially strong hints of the 1950s. But were this just another attempt to recycle some form of bop it probably would have barely merited a review. What makes it so much more interesting and notable is the way that ghosts and echoes of pre-bop jazz mingle with more recent approaches in a mood of striking conviviality. Of course drummer Allan Browne has spent over half his marvellous career playing the perky stomps, struts, rags and blues of classic jazz, and infusing them a uniquely Brownian combination of wryness, poeticism and groove. Ever since he began operating in more contemporary idioms over 40 years ago the same qualities have been evident, albeit somewhat shaken and stirred, and with more scope for his profound gifts of applying delicacy of touch and introducing telling use of space to the music. What may have been less obvious to some is the way that Julien Wilson also draws on this pre-bop heritage. To generalise outrageously there was a tendency for bebop to make the sounds of the instruments shrink, as agility became a shiny new deity in the music. Before bop pure sound was much more a musician’s signature: sounds that had the heft to surge over the vigour of a big band and to fill a room unamplified. And if you made sounds as big on a tenor saxophone as Coleman Hawkins and Ben Webster did you could afford to breathe a little; to leave some space and gather your thoughts while the vibrato of the last note lingered in the air like eye-contact between lovers. Wilson understands all this: understands that a single note played with a sound to make your hair curl is worth a thousand thin, reedy ones. His tenor carries the mass to make a tune feel better about the fact that it was ever penned. Just as importantly, he carries that attitude and weight across to his other instruments, and here he wheels out his soprano as well as his clarinet and bass clarinet. On all of them the tones are gorgeous, and the lines drip with joy and pathos and other emotions that remain wonderfully uncategorised. Then there is the leader. Sam Anning, too, makes each note a statement, not in a look-at-me way, but so that he is constantly fortifying and invigorating the music. Like Wilson’s instruments his bass has a fatness of sound, and like Browne’s drums it has a suppleness in the enunciation of the grooves. Anning’s idea of groove is to make them deeper rather than burdening them with macho ferocity or bravura flourishes. His solos, meanwhile, echo and reiterate the traces of vulnerability that characterise the playing of his colleagues. Anning took this recording with him to New York, where it was superlatively mixed and mastered by David Darlington. The bass is rich and thick without being overly prominent, the horns sing, and the drums nestle in the mix with the sweet touch that is such a hallmark of Browne when heard live. If you want to sample just one piece, try Wilson’s ‘Farewell’. Here is a trio that knows how to caress a tune but at times they press a little harder opening up no end of melodic explorations within a quasi retro context reminiscent sometimes of the late Paul Motian’s On Broadway sessions. Bassist Anning is joined by reedsman Julien Wilson and the omnipresent Allan Browne on drums. Anning contributes four originals amongst delightful memories by Walter Donaldson, Billy Strayhorn, Irving Berlin and Duke Ellington. Amongst the highlights is one of the pressing numbers by Anning ‘Princess Doug of Fitzroy’. Here Anning opens with a funky bass lick before Wilson states the melody on tenor, which is wonderfully spatial leaving plenty of room for the bass and Browne who simultaneously states the melody and the beat on the drums.Wilson’s tenor reaches further out within context before Anning contributes a fine solo. Elsewhere the disc’s dimensions are increased by Wilson’s soprano, clarinet and bass clarinet but it’s his beautiful Lester Young like tenor that shines often with sensually bent notes. No overdubs though, just solid heartfelt, spontaneous and glorious playing. A reed led trio can be a daunting challenge over the course of a full length album, but happily the reverse is true here. This is an album full of sublime playing, gorgeous sounds and great arrangements. To compliment Anning’s luscious bass on this, his second album, he is joined by veteran master drummer Browne and the sensuous reeds of Wilson. This is understated playing, there are no brash solos or over the top performances, restraint is the key here and its works so well. Anning has selected a mix of originals, including the funky and intriguingly titled ”Princess Doug Of Fitzroy” together with some less known standards, for example, incisive treatments of Billy Strayhorn’s “Little Brown Book” and Ellington’s “Creole Rhapsody”. Wilson is the complete musician, the use of multi reeds gives the album a more varied feel no more evident than on the track that bookends the album. On the opening take of Anning’s “Cactus Flower” Wilson is on tenor but in the closing version, he displays his talents on bass clarinet. If there is a criticism, it’s that Browne is often back in the mix and on occasions his subtle percussive effects hard to discern, particularly on Wilson’s clarinet led “Farewell”. Nonetheless, this is a fine album from three excellent players. Bassist Sam Anning’s second album as leader came about by accident. He had been based in New York for a year or two when he returned last November for some gigs with NY-based vocalist Cyrille Aimee. A snag with his visa paperwork meant he had to delay his return to the States, and he filled the time by booking a recording session with saxophonist Julien Wilson and drummer Allan Browne. Thankfully, Anning is a better musician than visa applicant. Sweethearts is one of the strongest local releases this year. The session is bookended by two brief, meditative version of an attractive original, ‘Cactus Flower’. Between them, the trio plays a few originals (three by Anning, one by Wilson), and some not-too-standard standards, including Billy Strayhorn’s ‘Little Brown Book’ and two by Irving Berlin, ‘The Best Thing For You’ and ‘Remember’. This is a relaxed session, the three players obviously familiar and comfortable with each other’s approach. Wilson is eloquent on his usual tenor saxophone – his interpretation of the Strayhorn ballad is masterful – but also effective on the tracks where he switches to soprano sax, clarinet or bass clarinet. He is mostly in a restrained mood here, but there is still the occasional hint of urgency or fire in some of his flurries or exclamations. Anning takes several articulate solos, and elsewhere combines seamlessly with Browne in maintaining a flexible pulse. 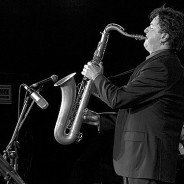 Australia has produced few tenor saxophonists of note, especially given the wealth of exceptional practitioners on other instruments. Among those to stand out, a direct lineage of influence runs from the late Merv Acheson to the explosive Mark Simmonds and on to Julien Wilson. Central to that lineage is a concept of how the horn should sound: massive, sprawling, wearing its heart on its sleeve, and gripping the listener from the first note. Working over his open-ended, engaging compositions, Wilson produced a sound that was haunting and burly – a rare combination that ensured the simplest melody was arresting. Joining Wilson from Melbourne in this band was Stephen Magnusson (guitar), with Sydneysiders Carl Dewhurst (guitar), Cameron Undy (bass) and Simon Barker (drums). This twin-guitar format worked superbly. Magnusson and Dewhurst are not only two of Australia’s finest guitarists, but two of our most pure and instinctive improvisers, sharing an overlapping aesthetic sense. At one point they were left to their own devices, and rather than bombard the audience with duelling crescendos they just wove a spider’s web of sighs. Both also crafted solos that drew one into a particular sound world, and then expanded on the sonic possibilities of that world. Perhaps it was more remarkable that Barker could do the same in his bristling drum solos.He and Undy often made the rhythms lurch and then roll in great waves, rather than arrive as a constant groove. Undy produced one of the night’s most memorable solos, when, after much agitation in the music, he claimed the foreground with massive, slow-moving notes. Each hung in the air long enough to almost etch itself on the walls, and they combined into a melody that was both profound and deeply moving.